Psst. Julep's June Mystery Box! I love when they do these surprise boxes! I already snagged one! This time around along with the usual mega box ($200 value!) they have a limited edition mystery color hidden in some boxes! Remember to use the promo code: JUNEMYSTERY for the $19.99 price. 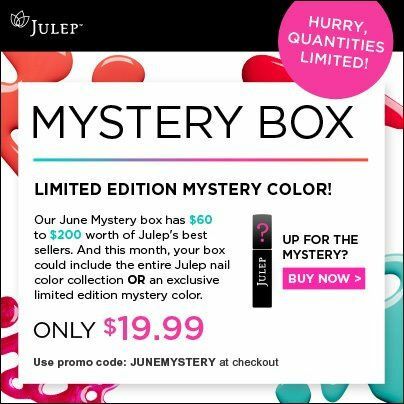 You can buy the mystery boxes here and don't forget that Julep Mavens get free shipping! Interested in becoming a Julep Maven? Get an introductory box for ONE CENT by going here and using the promo code: COLORS4ONE! ** This post contains my referral link. If you click on the link and sign up, I will earn credit towards free Maven boxes.